Stockport - Former England captain Wayne Rooney was on Monday banned from driving for two years and ordered to perform 100 hours of unpaid community work after pleading guilty to drink-driving. The Everton striker apologised for an "unforgivable lack of judgement" following his sentencing by a court in northern England for being nearly three times over the drink-drive limit while his pregnant wife and their three sons were on holiday. He was stopped by police when driving a woman's black Volkswagen Beetle at around 02:00 on September 1 and later arrested and bailed. 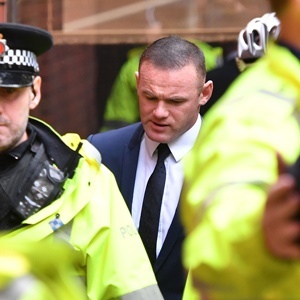 Stockport Magistrates' Court was told a breathalyser test showed Rooney's alcohol level was 104 microgrammes in 100 millilitres of breath. Rooney, 31, was banned from driving for two years and ordered to perform 100 hours of unpaid work as part of a 12-month community order. His legal team asked the judge to consider not imposing a community order because of his ongoing charitable work but he said he was "not convinced" that imposing a large fine "would have the same effect". Rooney, who rejoined boyhood club Everton after 13 trophy-laden years at Manchester United in July, tweeted an apology to his 16.4 million followers. "Following today's court hearing I want publicly to apologise for my unforgivable lack of judgement in driving while over the legal limit. It was completely wrong," Rooney said in a statement. Earlier, Rooney entered court in a dark blue suit and black tie and sat in the public gallery next to his agent Paul Stretford. Michael Rainford, defending, said Rooney accepted the facts of the prosecution case in full and highlighted his charity work. "He is not somebody who pays lip service to the charities as so many often do," he said. "This is somebody who is actually hands-on with the work he carries out. It is something that is very close to his heart." Following the hearing, the footballer left court with his lawyers again followed by a media scrum of TV cameras, press photographers and reporters. His entourage fought their way through the throng to a waiting people-carrier with tinted windows and Rooney was driven away. Everton manager Ronald Koeman said earlier this month the matter would be dealt with internally, adding that he was "disappointed" by the drink-driving charge. He was given a warm welcome at Old Trafford on his return to former club Manchester United on Sunday but it ended in disappointment with a 4-0 defeat for Everton. Rooney, England and Manchester United's record goalscorer, made a successful start to his second Everton spell following his return, scoring on his first two Premier League appearances.